For the better part of ten years I designed car racks and accessories for Thule, SportRack, TracRac, and a bunch of different specialty brands. In that time, people would come up to me with all sorts of ideas and product suggestions, including a storage system for the INSIDE of their vehicle. However when I asked them what they would use this product for there was never a definitive answer, so as a result it never reached store shelves here in North America. When I left Thule the concept was one of the many things I left behind. In fact, I almost forgot about the idea altogether until recently when a simple click on the Internet brought it all rushing back to me. BAM! There it was; the SeatRack Interior Cargo Rack, which features an ingenious design that includes mounting the whole contraption: by using the postholes for the seat headrest. How simple and brilliant is that? Retailing for $129.95, SeatRack claims that their system will hold up to 50lbs and can carry everything from skis and fishing rods to an action camera (with the proper adapter) all with the major benefit being that your gear can now be safe from the elements and from theft. 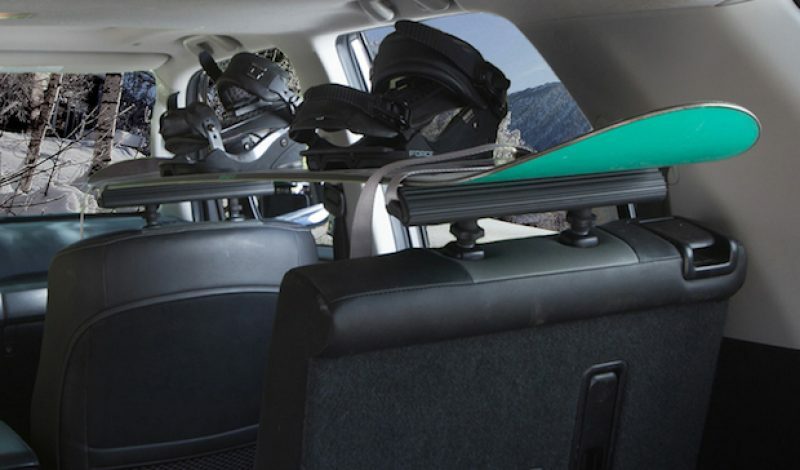 The only two drawbacks I could see would be not wanting to put your wet and grimy snowboard inside your vehicle – and the possibility that longer loads, if not secured properly, could go through your windshield. Additionally, one recommendation I would make to the folks at SeatRack is that they slot the top of their bars so that their system works more universally with accessories from Thule and Yakima, though that may not be an issue if SeatRack’s bar is small enough for their accessory mounts to wrap around. Overall, I’m intrigued. This is a product that would get swallowed up in a product line by a big rack company. By living on its own with SeatRack it should be a success story. I plan on reaching out to these folks to see if they’re interested in some long term testing by someone with my background. Stay tuned!